Hi all! I am Nonna from Nonnas Scraps and I am so excited be visiting here today! Thanks "BugBytes" for having me! An E-quaintance has this great blog: MichelleMyBelle. She has gone one step further by creating a card layout in Make the Cut software based upon these layouts. Not only does she have a great layout, it is ready to go into any project---almost immediately! And, she is so generous! 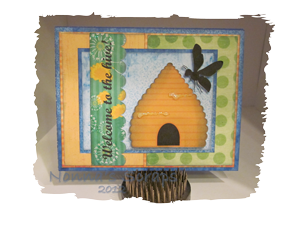 There are numerous layouts just waiting for you and me to use with the correct software! I needed a welcome card seemingly yesterday and Michelle came to my rescue! The design is found at Mojo Monday 233 March 19, 2012, (http://mojomonday.blogspot.com/), designed by Teresa Kline and converted by MichelleMyBelle (http://michellemybellescreations.blogspot.com/). Card base: 8.5 x 5.5"
Open Michelle's file in the MTC software. Setting everything up in the software make assembly sooooo easy! Upload the cutting files of choice and size appropriately. The images on the left will be printed on one 8.5 x 11" piece of paper. are printed only, not cut). The images to the right (circled) will be printed and cut on their own 8.5 x 11" sheet of paper using the "page" function of the software. Send the files to the cutter and quickly have fun assembling them! Seriously, it too more time choosing the bee and the hive than it did assembling the card. Genious! What a cute card! Love the bee! Thanks for the inspiration! Such an adorable card! Thanks for the new challenge site, I'm always looking for new sketches!